Kitchener, ON. : The North Bay Battalion and the Rangers battled it out at The Aud on Friday night. Riley Damiani, the game’s first star, scored a goal and picked up two assists, while Greg Meireles, the game’s third star, earned three assists in a 4-2 win. Luke Richardson saved 27 of 29 shots on net, which was good enough to get his 9th win of the season. North Bay took three penalties in the opening frame and it was on the third penalty, a tripping call against Payton Vescio, that the Rangers got on the scoreboard. Alexey Lipanov scored his seventh goal of the season on assists by Greg Meireles and Riley Damiani to put Kitchener up 1-0. Meireles’ assist meant that his streak of consecutive games with a point improved to seven. Not even three minutes later, at 19:23, a Nick McHugh pass out in front of the net to Riley Damiani was wristed home by number 13 on his 13th goal of the season to put the Rangers up 2-0. Luke Richardson was flawless in the first period as the Rangers outshot the Batallion 14-9. The Battalion got on the board at 7:39 of the second period when a Rangers turnover led to a rush the other way that ended with Justin Brazeau, the OHL’s third-leading goal scorer, netting his 27th goal of the season to make it 2-1. Justin MacPherson took a slashing penalty, Kitchener’s first penalty of the game, late in the second frame, and Mason Primeau notched his 9th at 16:55 to even the game up, 2-2. The second period would end with the Rangers still up in shots, 26-22. At 6:06 of the third period, a Justin MacPherson (5) shot deflected off the leg of Chase Campbell and into the back of the Christian Propp’s net to restore the Rangers advantage. 3-2. Only 43 seconds later, McHugh doubled up the Rangers lead on his sixth goal and the final goal of the game. 4-2. Richardson made 27 saves on the night while Kitchener managed 34 shots on the night. 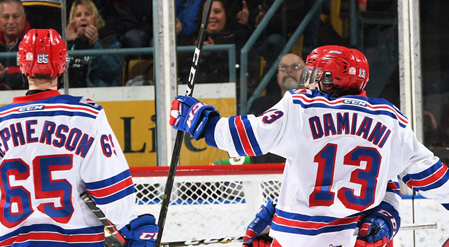 The Rangers next home game is on Sunday, December 9 at 2:00 pm versus the Kingston Frontenacs. The next away game for Kitchener is on Thursday, December 13 at 7:00 pm vs the North Bay Battalion. Luke Richardson Backstopped Rangers To Victory Over Windsor Spitfires.